The government of Cyprus (a small island country near Turkey) announced they want to charge a one time tax on all their citizens’ savings and checking accounts, up to 9.9% of their balance (O_o) This is so the country can qualify for a $13 billion bail out package which they so desperately need. It certainly sets a very controversial precedent for countries facing bankruptcy. Cyprus citizens rushed to the banks to withdraw their cash so they won’t be taxed only to find out the government has ordered financial institutions to stay closed for fear of a bank run. If it’s not even safe to store your money in the bank anymore, where CAN you put it? The Fed is continuing its money easing policy and with an increased supply of cash and credit in the economy we will inevitably see some kind of inflationary pressure in the future. I was recently looking at the price of gold and noticed that it has really come down from a year ago. It also seem like the price of gold has found a support level at around $1550/oz. Well today gold is roughly at $1600/oz. I like to buy stocks when they are undervalued. But right now it’s hard to pick a good company because the US stock market is at an all time high, lol. However gold is near its 52 week low. And historically it has been a great store of value, and a hedge against uncertainty and inflation. So I think this is a golden opportunity for me to start accumulating some physical gold. So earlier today I went to the local bullion exchange and bought myself a one ounce .99999 fine gold maple coin. This shiny little bullion can be sold at any gold dealership. But it also has some properties that make it unique like a collectible coin. 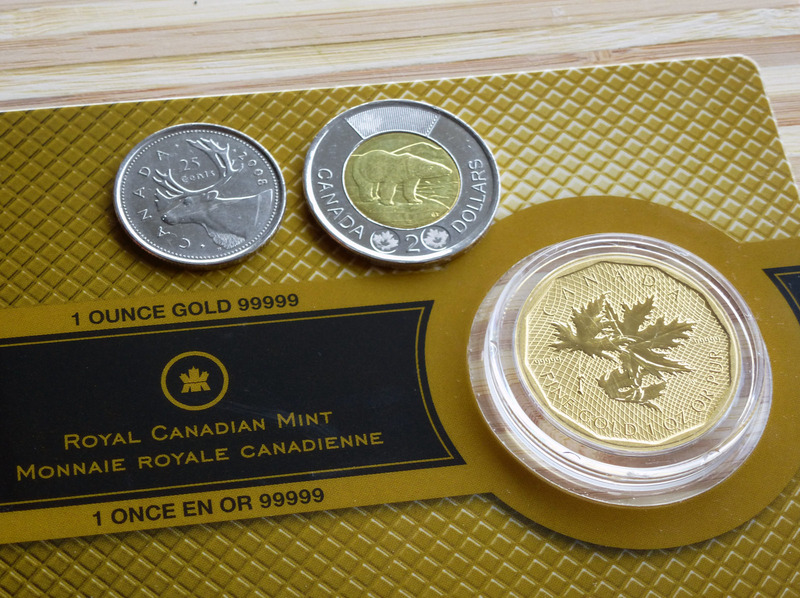 For example it’s 99.999% gold which the Mint said is unrivaled for its purity, compared to the standard maple leaf coin in circulation at only 99.99%. It also has a mintage so it’s more rare than the massively produced standard coins. Due to these special features it’s 2.2% more expensive than the standard maple leaf coin. But for an unmatched work of art and engineering I think that’s very reasonable. I spent $1750 on this little beauty today. The cost fluctuates depending on the market price of gold but the place I bought mine from, VBCE, has a website that lists their current spreads so you can check online for the latest prices. Click image below to enlarge. I included a toonie and quarter in the shot to show scale. 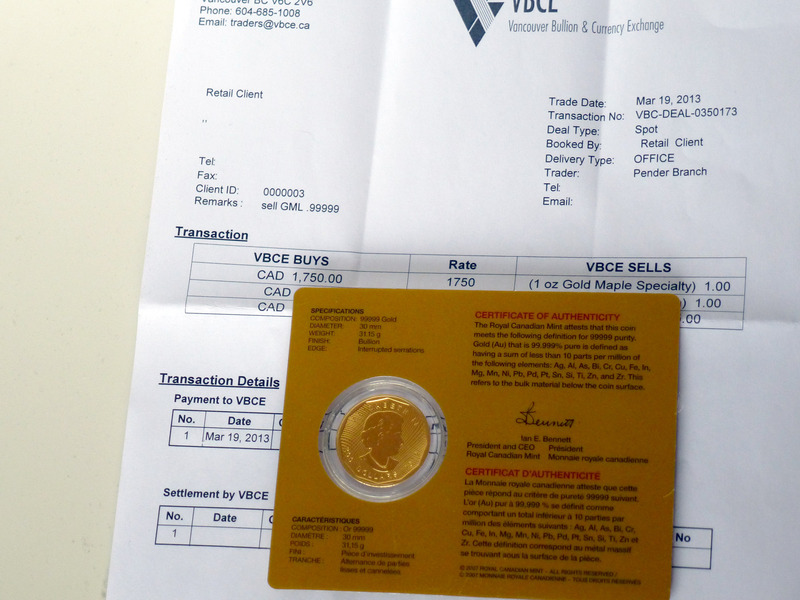 As you can see the gold coin is enclosed in a plastic case and set in a 5″ x 4″ laminated card. On the front the coin displays 3 maple leaves matching the design of the larger 100 kg coin. On the back the coin displays Queen Elizabeth II and a visible “200 DOLLARS” is imprinted to indicate the face value of the coin. The card represents a certificate of authenticity backed by the Royal Canadian Mint. Overall I give this coin 10/10. Great quality. Would buy again 😀 Click image below to enlarge.